My Blog@CACM post for this month is on JES, the Jython Environment for Students, which at 14 years old and over 10,000 downloads, is probably one of the oldest, most used, and (by some definition) most successful pedagogical Python IDE’s. I’m sad about this one, because we use and like this textbook, but I think it’s time to move to Python 3. Is there a compatible library providing the API used in the text? Short answer: No. There are no compatible Media Computation libraries for CPython 2 or 3. We keep trying. The latest attempt to build Media Computation libraries in CPython is here: https://github.com/sportsracer48/mediapy. It doesn’t work on all platforms yet, e.g., I can’t get it to load on MacOS. We have yet to find a set of libraries in Python that work cross-platform identically for sample-level manipulations of sounds. For example, PyGame’s mixer object doesn’t work exactly the same on all platforms (e.g., sampling rates aren’t handled the same on all platforms, so the same code plays different speed output on different platforms). I can do pixel-level manipulations using PIL. We have not yet tried to find libraries from frame manipulations of video (as individual images). I have just downloaded the relevant libraries for Python 3 and plan to explore in the future, but since we can’t make it work yet in Python 2 (which has more mature libraries), I doubt it will work in Python 3. I complained about this problem in my blog in 2011 (see post here). The situation is better in other languages, but not yet in Python. I have been building Media Computation examples in GP, a blocks-based language (see post here). Jeff Gray’s group at U. Alabama has built Blockly-like languages Pixly and Tunely for pixel and sample level manipulations. The Calico project supports Media Computation in IronPython (based on Python 3) and many other languages, because it builds on .NET/MONO which has good multimedia support. 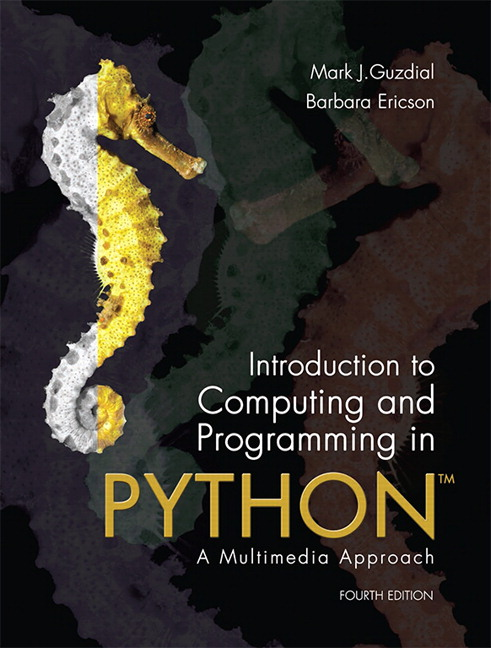 When we did the 4th edition of our Python Media Computation textbook, I looked into what we’d have to change in the book to move to Python 3. There really wasn’t much. We would have to introduce print as a function. We do very little integer division, so we’d have to explain that. The focus in our course (non-technical majors, first course) is at a higher level than the differences between Python 2 and 3. I am confident that, at the end of our course, the majority of our students would understand the differences between Python 2 and 3. As we move more to browser-based IDE’s, I can support either Python 2 or 3 syntax and semantics. Preparing students for industry jobs using exactly CPython 3 is simply not a priority in our course. Interesting perspective from a blogger in the Scratch community, liked below. I do frequently hear the pattern described in the post quoted below. “I’ve started by daughter/niece/local-school on Scratch, and now I want to know how to move them into something ‘real’ (e.g., text).” I typically point them to amazing things that can be done in Scratch (like Alex Ruthmann’s beautiful livecoding of music in Scratch). I recently got a chance to play with GP, a new programming language from John Maloney (of Scratch fame), where all blocks and texts are isomorphic. There’s a slider that lets you switch from one to the other. Even the debugger and class browser show up with tiles. Where does that play out in this debate? GP is the first blocks-based language I’ve used with the right primitives to do MediaComp, so I built one of my examples in it. Took me about three times as much time to write and four times as much space (in screen real estate) as in Python (even with John looking over my shoulder guiding me). Maybe that’s not a bad thing — maybe that encourages a different style of use. Next time I try something like that, I’m far more likely to think about building my own blocks and using more abstraction to save on dragging-and-fitting effort. Note the scare quotes around “real programming”. Generally, a “real” programming language is text-based (C, Python, etc.) and apparently qualifies as real because it’s used by well-known developers for something. Obviously I disagree with disqualifying Scratch as a real programming language. via Making vs Coding | byte. JES 5.02 is now released at https://github.com/gatech-csl/jes/releases/tag/5.020. I have links to all the main downloads at http://mediacomputation.org . This is a maintenance release. Thanks to Nina Koch’s student, Henry, we have fixes for colorizing and some other problems. Henry has also written code to allow for capture of keystrokes and mouse movement in a picture window, so that you could build some simple games. I’ll save that for JES 5.10. You can find all the fourth edition Powerpoint slides (including a 68Mb zip of all of them) at http://coweb.cc.gatech.edu/mediaComp-teach/60. I’ve put some of the Peer Instruction question slides into the chapter PPT slide decks, but you can find more at the instructors-only website (see the Media Computation website for more on the teacher website). Before we manipulate pictures, we manipulate letters, words, and language, e.g., build “MadLib” and “koan” generators, and encoding and decoding keyword ciphers. Language is a medium, too, and it’s easier to get started (for some folks) with the smaller-iteration loops of text before getting to the thousands-of-iterations loops of pixels in a picture. It’s an optional chapter — everything introduced there gets introduced again later. Since the new version of JES fixed a round-off error in the Turtle class, we can do recursive turtle manipulations now (which tended to get messed up in earlier forms of JES). I juggled content around so that we do more with conditionals and querying the pixel for its position, before we introduce nested loops. Nested loops are really hard for students, and I learned (from seeing the code that my students wrote) that they can do far more than I’d guessed with single loops — even with multiple pictures. I included more of that. I have tried (for the last two editions) to provide screen-scraping examples, e.g., writing code to pull weather, news, or friends’ information from websites. It’s getting harder and harder to write that kind of code. Instead, I decided to provide more code that parses CSV files, as can be found at Open Data Journalism sites (like at The Guardian) and sources like the US Census. The examples are still about parsing out useful information, but it’s a lot easier to parse CSV and encouraged at these sites. There are more end of chapter problems, and new pictures. And trying to catch all the errors in the Third Edition that master teachers like Susan Schwartz (at West Point) found. We’re working on teacher resources now. Currently in development (aiming to have ready in the next couple months) the Powerpoint slides for each chapter of the book, a collection of all the code in the book for teachers, and a solutions manual for every end of chapter problem. These are surprisingly controversial. There are lots (mostly University) teachers who think that I shouldn’t provide any of these resources — teachers should be able to develop all of those themselves. Most of the high school and community college teachers I know appreciate having them. In searching for the Fourth Edition on Amazon, I read the comments on the Third Edition (see here). Authors probably shouldn’t read the reviews of the book — they’re painful. But I did, and even worse, I actually responded. Its biggest problem: false advertising. This is NOT a book on Python, it’s about JYTHON – A Java based imitation of Python. Why? Well, there’s some pretty software, available to download, which uses the the JRE. The author chose to stick with this “easy learning environment” and basically cripple anyone wanting to write Python code for Blender, Maya, Android etc. You may learn to program from this text, but don’t expect a trouble-free life when you get exposed to the real language. Everything in this book is useful when wanting to write Python code for Blender, Maya, Android, etc. This is an introductory book on data, loops, conditionals, and objects. Those parts of Python are identical in this book and in the Python that you’ll use in Blender, Maya, and Android. For introductory Python programming, Jython and CPython are exactly the same. As an introductory book, I would expect a section on how to install and configure Python. Written covering Windows, Linux, and the Mac OSX. There is no such section; the whole point of Jython is to “hide” this technical level. Which is fine for learning loops etc. but leaves a student lost when encountering Python out in the real world. It’s an interesting perspective, kind of a “rugged individualism” approach. I do agree with the notion of desirable difficulties in learning (see more here), but don’t agree that installing Python is one of those. Do most Python programmers install Python themselves, or is it already installed on the servers, computers, etc. that they will be programming? Is it a critical part of learning a language? Is it significantly different than installing JES (try that here)? Are you “lost” and unable to program if you don’t install it yourself first? A sad addendum to this story: Our Media Computation data structures book (see the Amazon page here) has gone out of print. The publisher didn’t notify us. Someone approached us about using the book, and was told that it was out of print. When I queried Pearson, they admitted it. More, because it’s not out of print everywhere (I guess it’s available in some non-US markets), Pearson won’t let us post the content anywhere. It’s a dead book now. 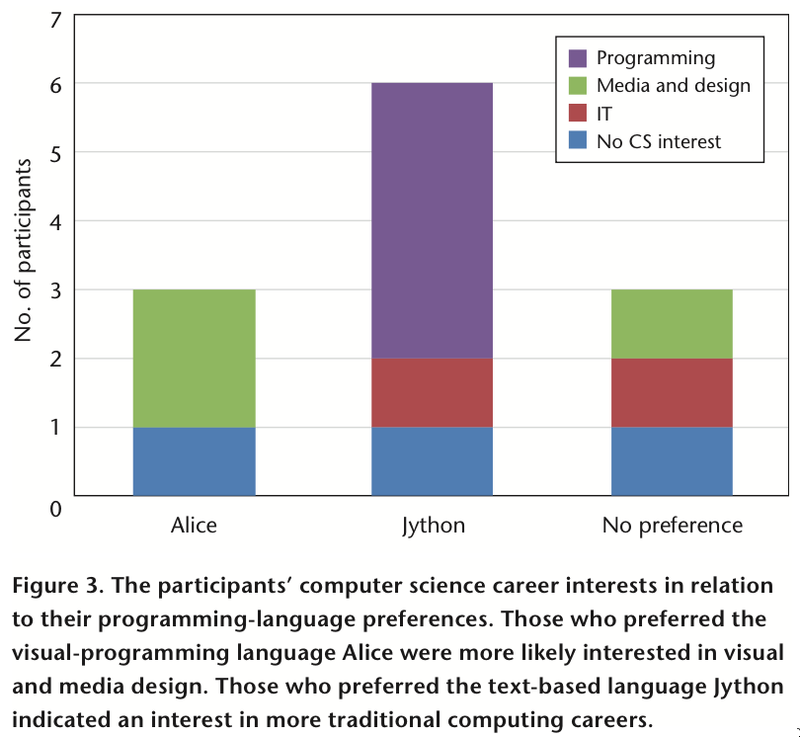 One of the results from Betsy DiSalvo’s dissertation on Glitch (see a post on that work) that I found most interesting was that there wasn’t a clear winner between graphical, drag-and-drop programming (Alice) and text-based programming (Python). She has now written up that part of the dissertation work, and it’s linked below. To determine appropriate computer science curricula, educators sought to better understand the different affordances of teaching with a visual programming language (Alice) or a text-based language (Jython). Although students often preferred one language, that language wasn’t necessarily the one from which they learned the most. via IEEE Xplore Abstract – Graphical Qualities of Educational Technology: Using Drag-and-Drop and Text-Based Programs for Intro….